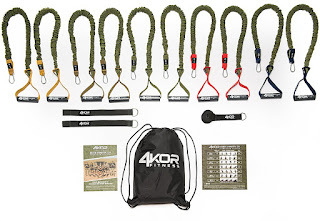 The original Elite Forces Resistance Cords Set from 4KOR Fitness is designed to be a full-body home-gym piece of equipment. It was developed with durability and worry free training in mind. The protective nylon sleeve protects the inner band from tearing, ripping, and from being overstretched. The Elite Forces cords are stackable, allowing you to create your own custom workout with up to 100 pounds of resistance training. With its compact size, it is easily portable and you can get your workout anywhere, whether you're at home, traveling, or even in a hotel room! The Elite Forces 2.0 Shoulder Strengthening System is purely designed to provide significant improvements in shoulder strength and mobility, but it is also designed for safety. 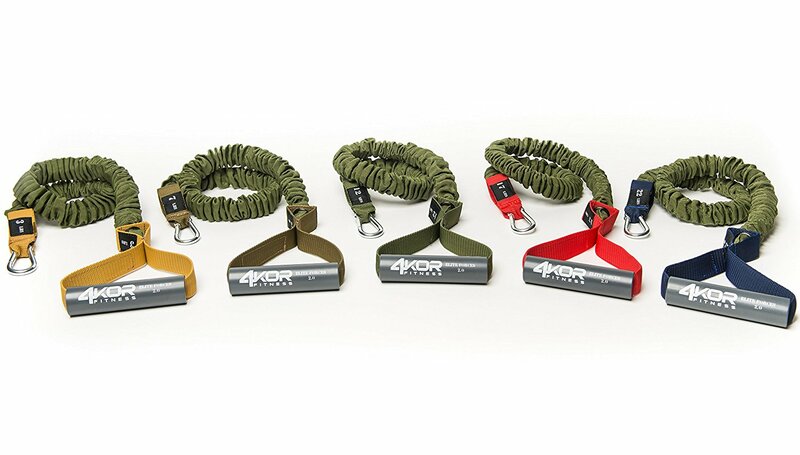 Each 4KOR cord is wrapped with a strong nylon sleeve that protects the band from damage, overstretching, and also protects you if the band snaps during use. A permanent handle is built-in to each cord, with a built-in carabiner on the other end. When it comes to strengthening your shoulders for CrossFit, baseball, golf, swimming, or tennis, this is the most effective tool. 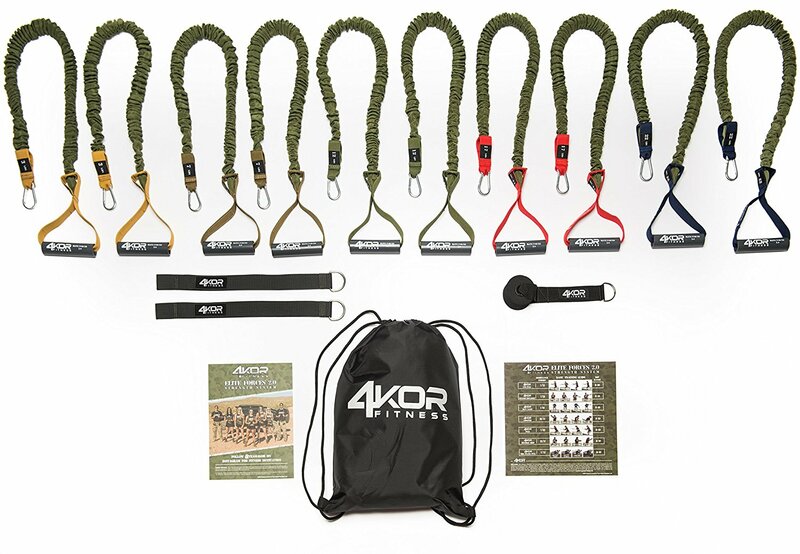 The 4KOR Resistance Cord System is a simple well designed product perfect for shoulder strengthening in a progressive manner. I have shoulder problems, including pains and unequal right and left strengths from playing baseball my entire life through college. I have loved having something helps me isolate my shoulders, allowing me to work on strengthening them in a direct and controlled manner. Each package comes with a poster that describes proper positioning and movement for the different pulls. I found this extremely useful in progressing my shoulder strength. Initially doing some of the movements brought about some pain, but as I learned to better control and activate my shoulder muscles I built up strength and experienced less pain. This is a very durable and heavy duty set of resistance bands. There's a protective sleeve that covers each band and prevents the band from being damaged and protects you in case the band were to snap. This set is very comparable to the more expensive sets I've used at my Crossfit box, but this set is very reasonably priced. Starting off at only $99 for a set you literally get 2-3 times as many bands of similar quality as compared to other brands! My only negative feedback is with so many pieces, it makes it somewhat difficult to get everything back into the bag, but I normally keep the bands out anyway, so not the biggest issue. This product has held up well with no issues and the handles are comfortable and durable. I would recommend this product to anyone looking to isolate their shoulder muscles and work on activating them or anyone in sports that have repetitive upper body motions such as baseball or swimming to help maintain an even muscle strength of both sides of the body as well as preventing injuries to these areas. I have a Titan rack that the system straps efficiently to. I can leave it attached because it does not interfere with any of the other functions performed on the rack. Inactivity of the shoulder is the enemy and this system gives me all I need. What you get is well made, in a package that is easy to set up and use. The instruction plaque is very clear and easy to understand as far as reps and form. If you compare to seeing an Ortho for a referral to a PT to teach you these exercises it is a smoking deal. I have some severe shoulder problems which have responded very well to this system. I use them 3-4 times per week for shoulder warm up, warm down and strengthening. Definitely worth the expense. Order yours on Amazon below!